This was very clever. A friend posted it on my site. For those who don’t get it: pre-denomination means “before the Protestant Reformation (read: Rebellion).” The Protestants gave birth to the multiplying denominations. Before them there was the pre-denomination — the Catholic Church. 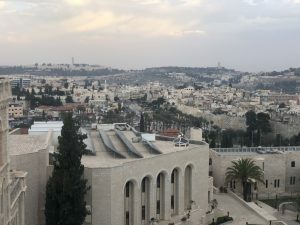 I just took a nice walk through Jerusalem this morning and can assure you it is peaceful and quiet here and there are no incidents or protests. If there were to be protests and problems in Jerusalem they would normally happen around the Damascus gate especially on a Friday which is the holy day for Muslims. But there was none of it. Here is a picture from our hotel window looking down on the whole street including Damascus gate. It is peaceful and quiet with no issues. If you see news where there are problems it’s usually down in Gaza (far away from us) and they’re using archived video footage from years past.